Description Technical Specs What's in the box? 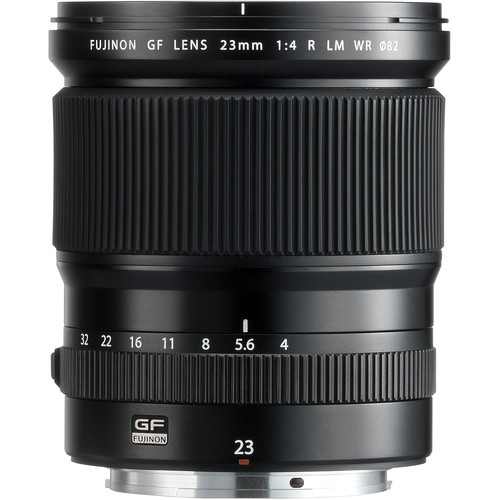 Presenting a super wide field of view, the GF 23mm f/4 R LM WR from Fujifilm is an ultra-wide 18mm-equivalent prime designed for the G-mount GFX camera system. 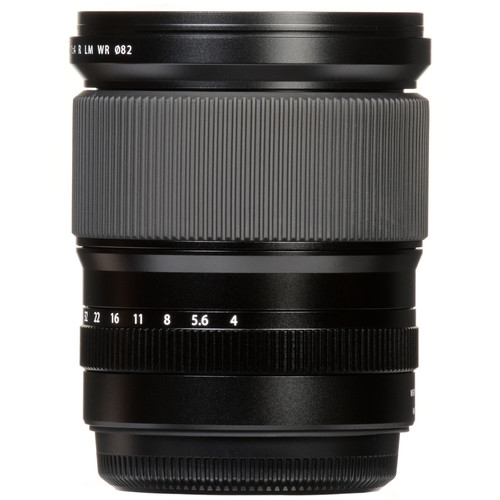 Ideally suited for architecture and interior photography, the lens's design employs a pair of aspherical elements to control distortion and spherical aberrations for accurate rendering, and a series of low dispersion elements are also featured for improved color accuracy and clarity. Additionally, a Nano GI coating has been applied to suppress lens flare and ghosting for improved contrast and color. 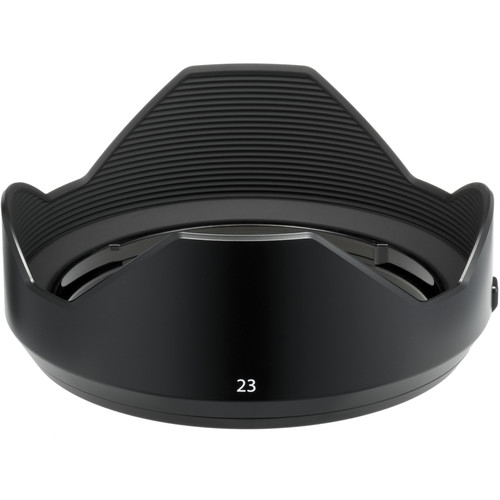 Balancing the optical attributes, the lens also utilizes a linear AF motor with an internal focusing design for quick and quiet focusing performance, and a manual aperture ring also avails intuitive exposure adjustment and a Command position permits making camera-based aperture selections. 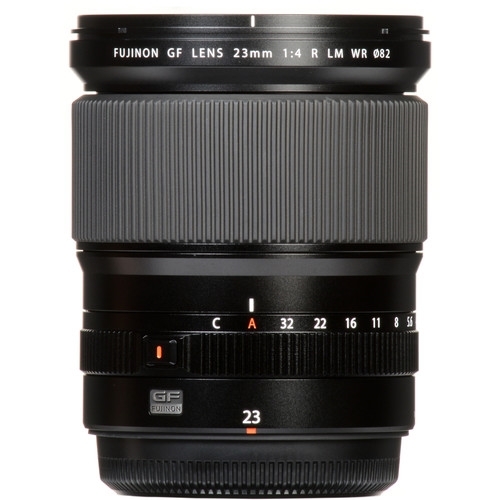 Additionally, the lens is also dust-, freeze-, and weather-resistant for use in trying environmental conditions. 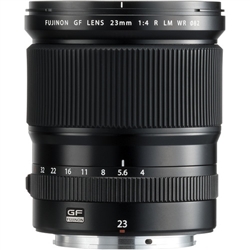 Ideally suited for architectural, landscape, and interior photography, this wide-angle prime lens offers an 18mm equivalent focal length. The 15 elements in 12 groups optical design incorporates a pair of aspherical elements to reduce spherical aberrations and distortions for cleaner, more realistic rendering and sharper image quality. Two extra-low dispersion elements and one Super ED element are also featured to control color fringing and chromatic aberrations for improved color fidelity and clarity. A Nano GI coating has been applied to individual elements to suppress surface reflections, flare, and ghosting for improved contrast and color accuracy when working in strong lighting conditions. A linear AF motor is used for quick, quiet focusing performance and an internal focusing mechanism maintains the overall length of the lens during operation and also produces consistent optical performance throughout the focusing range. 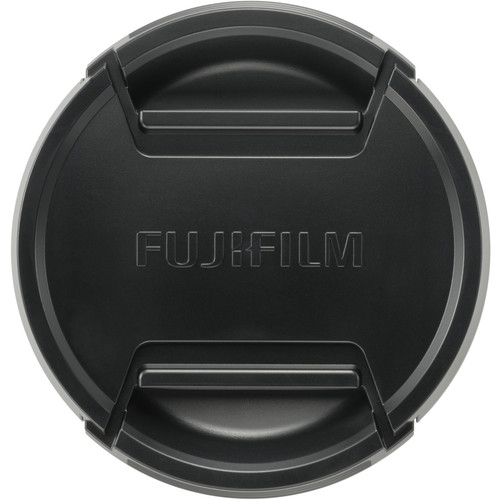 Physical aperture ring allows for intuitive adjustment over exposure settings, and incorporates a C (Command) position to permit camera-based aperture setting. Dust- and weather-sealed physical construction enables working in harsh climates and temperatures as low as 14°F. Rounded nine-blade diaphragm contributes to a pleasing bokeh quality. Box Dimensions (LxWxH) 8.3 x 7.5 x 6.5"
Other products that may interest you. Be the first to know about the latest deals and promotions. ©Copyright 2015 WWW.FOTOCARE.COM. All Rights Reserved. Built with Volusion.